FTF’s favorite family spots in San Antonio include historic sites and armadillos, Mexican cafes and a lively riverfront, all in this southern Texas city. And as a destination, it has much more to offer than a temperate climate to account for its year-round popularity. For more information on the many attractions in the area, contact the San Antonio Convention and Visitors Bureau (800/447-3372); for information on the top family-welcoming hotels, see our review. If you can plan your vacation for August, the city welcomes families with its annual Kidcation Week. You’ll find special offers on hotels, restaurants and attractions, as well as special summertime events designed just for kids and their families.For Family Travel Forum’s picks of what’s appropriate for each age group, read on. This zoo, housed in a stone quarry, offers a Monkey Island, an Animal Nursery with cute newborns, and elephant rides. Brackenridge Park itself, just northeast of downtown, provides plenty of activities for the whole family, including the Brackenridge Eagle, a small train that makes a twenty-minute run around the grounds; a Skyride offers a higher view of the park and the city’s skyline. The well-known mega-aquarium and theme park is very popular with children. Observe dolphins, whales and other sea life or enroll your kids in the Adventure Camp. Be sure to plan enough time to take in the Shamu show; quite a splash. New for 2014 is a 13,500 square foot aviary that contains about 300 birds representing more than 50 species. This small but well-designed children’s museum promises visitors a good time that’s out of the harsh San Antonio sun. This 25-acre park in northeast San Antonio opposite Heroes Stadium was built by philanthropist Gordon Hartman, who is dedicated to helping people with special needs enjoy themselves. Swings, train rides, and play areas are fully accessible to those in wheelchairs, and play objects are designed to engage visitors with a variety of physical or developmental challenges. According to their website, “It is the World’s First Ultra Accessible Family Fun Park designed specifically for children and adults with special needs, their family members, caregivers, friends and the entire community.” Reservations are requested by phone or online; admission fees are free to those with special needs, $5 for their caregivers, $15 for general visitors, free for ages 3 and under. Without a doubt, the attraction that places San Antonio’s name on the map. Alamo actually means cottonwood, the native poplar. The city’s first Spanish mission, today its ruins serve more as a shrine to the brave defenders who fell in battle in March of 1836 during the struggle for independence from Mexico. Make an effort to see one of the other San Antonio Missions as well. This is a widely popular musical theme park with several international locations and the world’s biggest wooden roller coaster, as well as other water rides; perfect for active kids in the warmer months. Brand new for summer 2014 is a tropically themed area with several new attractions and guest amenities, including the extreme thrill slide complex, Bahama Blaster. The ride will use a unique launching capsule to drop riders down an astounding six stories, where they’ll free-fall and twist through loops and coils at 40 miles per hour. Thrill-seekers only need apply! This Museum offers exhibits dedicated to the diverse history, art and cultures of the surrounding Texan region. A rather eccentric branch of the old vaudeville show (turned comic strip, turned TV show, turned “odditorium” full of wild objects) with such exhibits as the world’s biggest ball of barbed wire. Fun! It’s centrally located across from the Alamo along with the Plaza Wax Museum. Accessible on both sides of the below-street-level San Antonio River, this extensive pedestrian walkway — recently expanded to accommodate bicycles and joggers in the less congested stretches — is the city’s most important attraction. With steps leading down from bridges, the river’s banks offer a fun refuge with sidewalk shops, galleries, cafes, and bars and music. If you’re visiting in winter, do not miss the annual Christmas Boat Parade, when locals deck out their motorboats with every type of lighting design imaginable. 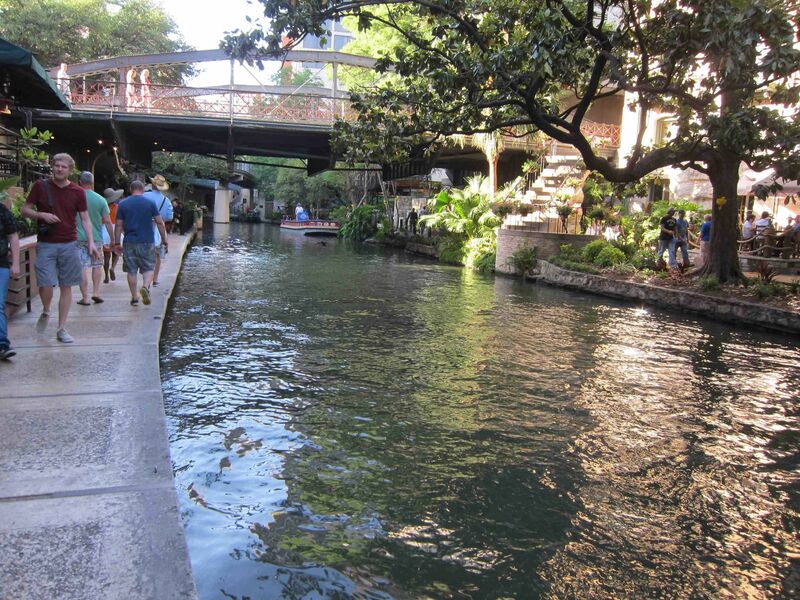 Kids will enjoy a river boat tour with Rio San Antonio Cruises has barges leaving from below the Commerce Street Bridge near the Hilton Hotel every 10 or 15 minutes from about 9am-10:30pm in the summer and every half hour during the winter. The tour takes about three-quarters of an hour, two and a half miles up the river. Dinner cruises are offered and evenings are usually a cooler time to tour. This fun museum houses a large and unusual collection that focuses on South Texas history and science. School age kids get plenty of hands-on action here, especially when they enter the four-story H-E-B Science Treehouse, which features interactive experiments and activities. Dinosaurs: Vanished Texans, allows you get up close and personal with a Tyrannosaurus Rex. If you are lucky enough to be visiting San Antonio during its annual Fiesta celebration in April, the Witte gets into the party spirit by exhibiting a dozen fiesta ball gowns from its collection of over 230. If you are traveling with a princess in training, the frills, ruffles and lace of these eye-catching extravaganzas are sure to be a hit. In spring 2014, the Witte Museum will introduce a state-of-the-art interactive adventure that focuses on getting the body up and moving and inspiring a balanced and healthy lifestyle. The H-E-B Body Adventure exhibit offers visitors four floors of fun activities that will feature themes relating to health, IQ empowerment and wellness. Kids under age 3 are admitted free to San Antonio’s art museum, housed in the historic Lone Star Brewery which dates back to 1884. The ninety-two acre site of the 1968 World’s Fair which celebrated the city’s 250th anniversary. Brick walks link some historic old homes, museums, restaurants, art galleries, and the 600-foot Tower of the Americas, which offers a view of the city that’s particularly stunning at sunset. Thirty-three acres of beautiful flora, landscaped to look like a natural rural area. Walking trails are laced throughout the grounds, which include a rainforest area, conservatory, children’s garden, and a handsome gazebo high on a hill with a grand view of the city. For art-loving families, a local mansion with an excellent collection of modern art. Wonderful respite during the often hot summer days. Pearl is a new culinary and cultural destination in San Antonio. It’s a hipster gathering place where everyone is welcome to eat, shop and play along the banks of the San Antonio River. Shopping options include The Twig Book Shop, independently owned and operated. The Pearl is the place for foodie families. The Culinary Institute of America is here, offering hands-on cooking classes. The Saturday Farmers’ Market provides glorious local produce sourced from within a 150-mile radius. Cured is a popular dining spot. Set in a meticulously restored 1904 building, the vibe is nevertheless contemporary. Crowds come for the handcrafted cured foods, from charcuterie to pickles, unbeatable burgers and deliciously decadent desserts, like bread pudding made with homemade donuts. Everything we sampled was fresh and delectable. Next Article Next Article Should Kids and Casinos Mix on Vacation? For a bird’s-eye view of the town, ride up the 750-foot-high Tower of the Americas at HemisFair Park, site of the 1968 World’s Fair. You’ll find an observation tower and a restaurant at the top. You could win a trip for a family of 4 to San Antonio, by joining us on Twitter June 20, 8pm ET, for a group chat on planning family vactions sponsored by TravelingMom.com and The Complete Idiots Guide to the Best Family Destinations. Just follow the hastag #TMOM when you get to twitter and you'll be all set to post your thoughts. Scottsdale, Arizona is known as ‘The West’s Most Western Town’. With average of 300 sunshine days Scottsdale is fast becoming a popular tourist destination. There is plenty to do in this beautiful resort town.